Swami Vivekananda is the most influential philosophical personality in Indian history of 19th century. He was a Hindu monk and one of the most powerful spiritual leaders of Vedanta philosophy in India. Vivekananda was responsible for revival of Hinduism to the status of a major world religion during the late 19th century. He introduced the Indian philosophies of Vedanta and Yoga to the Western world. He dedicated his whole life for spiritual upliftment of mankind. He left no stone unturned and worked tirelessly towards betterment of the society, especially levitating the poor and destitutes. The young monk with his inspiring speeches and sermons has been an inspiration to many and ushered the mankind to the goals of self-improvement, mainly for the youth of the country. This explains why his birthday is celebrated as the National Youth Day in India. Swami Vivekananda was born on January12, 1863 in Calcutta to Vishwanath Dutta, Bhuvaneswari Devi. His real name was Narendranath Dutta. 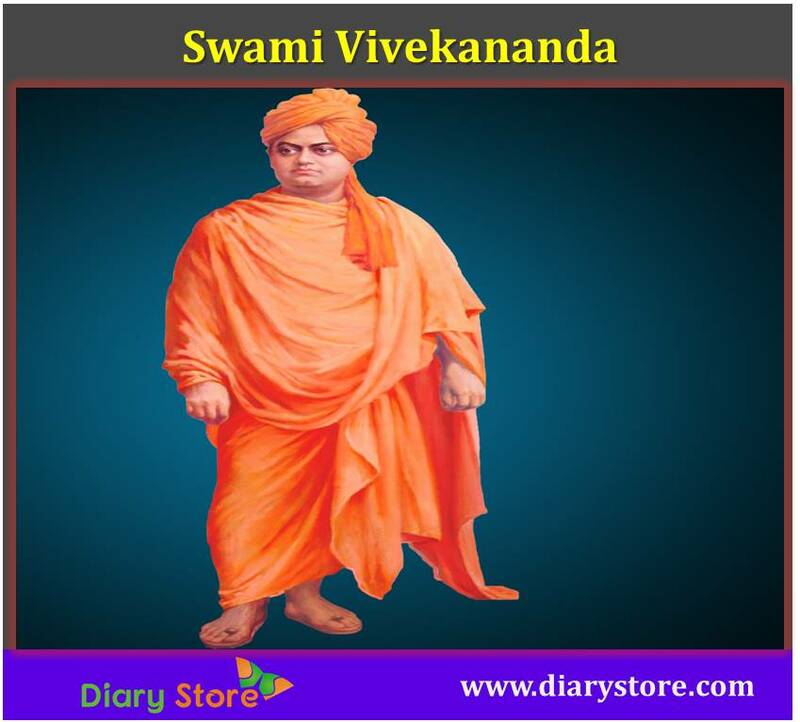 When he became a monk he acquired the name of Swami Vivekananda. His father was an attorney at the Calcutta High Court and his mother was a devout housewife. As a child he was very naughty and lively. He studied instrumental and vocal music. He was excellent in studies and also active in sports, gymnastics, wrestling, body building and also practiced meditation from a very early age. Vivekananda passed matriculation and joined in Presidency College, Calcutta on 1879. At the General Assembly's Institution (now known as the Scottish Church College) Narendra studied Western logic, Western philosophy and European history. In 1881 he passed the Fine Arts examination and in 1884 completed the Bachelor of Arts degree. He was an avid reader in a wide range of subjects. By the time he had graduated from the college, he acquired a vast knowledge of different subjects and at that time doubts about existence of God started cropping up in his mind. He associated himself with the functionaries of Brahmo Samaj for seeking clarification about existence of God and listened to several hymns, keerthans. But none of them could render any satisfactory reply to him. Swami Vivekananda also visited prominent spiritual leaders from all religions, asking them a single question, “Have you seen God?” Each time he came away without a satisfying answer. During his spiritual crisis, Swami Vivekananda first heard about Ramakrishna Paramahans from his professor William Hastie. Hastie suggested that his students visit Ramakrishna of Dakshineshwar to understand the true meaning of trance. Sri Ramakrishna Paramahans was a priest in the temple of Goddess Kali at Dakshineshwar and he was a great devotee. Vivekananda and his friends went to Dakshineshwar to see Paramahans. Vivekananda asked same question “Have you seen God?” to Sri Ramakrishna. The instantaneous answer from Ramakrishna was, “Yes, I have seen God, just as I see you here, only in a much deeper sense." Vivekananda, initially unimpressed by the simplicity of Ramakrishna, was astonished with Ramakrishna's reply. Although Vivekanada did not initially accept Ramakrishna as his guru (master) and opposed against his ideas, he was attracted by his personality and started to frequently visit him at Dakshineswar. Initially Vivekananda saw Ramakrishna's ecstasies and visions as "mere figments of imagination" and "hallucinations". Swami Vivekananda also rejected the Advaita Vedanta, the philosophy of non-dualism and often ridiculed the idea. But Ramakrishna gradually won over this argumentative young man with his patience and love. Swami Vivekananda’s father died on 1884. Due to death of his father he and his family suffered from financial distress. One day Vivekananda requested Ramakrishna to pray to the Goddess for the financial welfare of his family. Ramakrishna suggested him to go to the temple himself and pray. On Ramakrishna’s suggestion he himself went to the temple to pray thrice but failed to pray for money and wealth and ultimately prayed for true knowledge and devotion from the goddess. That day marked the complete spiritual awakening of Vivekananda and he found himself drawn to an ascetic way of life and accepted Ramakrishna as his Guru. In 1885, Ramakrishna suffered from throat cancer and was moved to Shyampukur in Calcutta, later Vivekananda took a rented house at Cossipore. Swami Vivekananda and other disciples took care of him during his last days. Ramakrishna taught that service to men was the most effective worship of God. Ramakrishna asked Vivekananda to take care of other disciples and in turn asked them to look upon Vivekananda as their leader. On 16 August 1886, Sri Ramakrishna passed away. After the death of Sri Ramakrishna, Vivekananda and other disciples around fifteen members started to live together in a dilapidated building at Baranagar in North Calcutta, which was named Ramakrishna Math, the monastic order of Ramakrishna. In December 1886, Vivekananda and other disciples went to Antpur village because the mother of Baburam invited to that village. Vivekananda and eight other disciples took formal monastic vows in Antpur, in the Christmas Eve of 1886 and Narendranath took the name “Swami Vivekananda” meaning "the bliss of discerning wisdom". In 1888, Vivekananda left the monastery as a Parivrajaka. He travelled breadth and length of the India for five years. During journey he observed much of the social, cultural and religious aspects of the people he came in contact with. He developed sympathy for the suffering and poverty of the people and resolved to uplift the nation. Swami Vivekananda went to America to attend the Conference of World Religions in Chicago in 1893. He attended the meeting to introduce Hinduism and his Guru Sri Ramakrishna’s philosophies. He faced many problems on his way to Chicago, but his spirits remained as indomitable as ever. On 11 September 1893, when the time came, Vivekananda took the stage and stunned everyone with his opening line “My brothers and sisters of America”, earning a 2-minute standing ovation from the crowd for the opening words. He spent more than two years in America and also founded the Vedanta Society of New York in 1894. Swami Vivekananda also travelled to UK. Many people became his disciples. Most famous among them was Margaret Nivedita. She came to India and settled here. After four years of touring in west Vivekananda returned to India in 1897. He reached Calcutta after a series of lectures across the India and on May 1, 1897 he founded the Ramakrishna Mission at Belur Math near Calcutta. The ideals of Karma Yoga were the basis for the main goals of the Ramakrishna Mission and the primary objective of the mission was to serve the poverty-stricken and downtrodden people who could never dream of core basic amenities in life. His obsessions also included various activities of social service such as setting up and running schools, colleges and hospitals, dissemination of doctrines of Vedanta through conferences, seminars and workshops, taking up relief and rehabilitation works all over India. On June 1899, Vivekananda once again toured the West accompanied by Sister Nivedita and Swami Turiyananda. He returned to Calcutta on 9 December 1900 and then settled at Belur Math, where he continued coordinating the works of Ramakrishna Mission, the maut and also in England and the US. On 4 July 1902, Vivekananda awoke early, went to the monastery at Belur Math and meditated for three hours, he taught Sanskrit grammar and the philosophy of yoga to pupils. Vivekananda went to his room at 7:00 p.m. after discussing with colleagues a planned Vedic college in the Ramakrishna Math; he died during meditating at 9:20 p.m. In the parlance of medical sciences, a rupture of a blood vessel in his brain led to the death. His disciples believe that the rupture was due to brahmarandhra (an opening in the crown of his head) being pierced when he attained mahasamadhi. He is said to have attained ‘Mahasamadhi’ and the great saint was cremated on the banks of river Ganga, opposite to the site where Ramakrishna was cremated sixteen years earlier. “If I love myself despite my infinite faults, how can I hate anyone at the glimpse of a few faults”..! Who is helping you, don’t forget them. Who is loving you, don’t hate them.